For the first time in 24 seasons in the top flight of the Southern Combination League, Hassocks have ended the campaign in the relegation zone as a 3-0 final day defeat to Pagham confirmed a bottom three finish for the Robins. They could yet sink further, a victory for Worthing United in their final game of the season next week against Lancing allowing the Mavericks to leapfrog the Robins, condemning them to finish in 19th place in the process. What this means for next season, nobody really knows. There are so many rumours abounding that it is difficult to keep up. 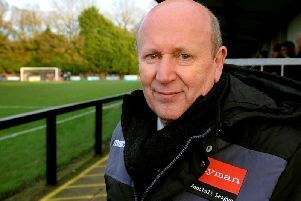 Some suggest that only one side will drop down from the Premier Division due to a lack of relegation from the Bostik League thanks to restructuring higher up he pyramid with others believe that there are a couple of clubs who finished outside the relegation zone who may be forced into Division One through ground grading. Whatever happens, this has been largely a season to forget for the Robins. There has been little to no consistency in selection until the final months of the season with 44 players being used and the club said goodbye to a number of the stalwarts who had battled so hard to produce great escapes from relegation over the previous three seasons. The one positive has been the form of the under 21 and under 18 players who were thrown in at the deep end as a result of the departures of the more senior players and they look like they could form a basis of an extremely promising side over the next few seasons. With the under 18s having the chance to wrap up a league and cup double in their League Cup Final with AFC Uckfield Town next Sunday and the under 21s knowing that two wins from their last two games will give them a first title as well, there clearly are plenty more good young players in reserve as well. Remarkably given the title deciders and other relegation battles going on elsewhere across the league, the Beacon had the biggest attendance of the day and of Hassocks’ season as 350 turned out to see if the Robins could shock Pagham and pull off their greatest of escapes. Unfortunately, this ended up being Hassocks’ season in a microcosm. They battled hard but were ultimately undone by some poor defending against a vastly more experienced side. The Lions had nothing to play having already secured a third placed finish but with a Sussex RUR Charity Cup final meeting with local rivals Chichester City to come in midweek, wanted to build some momentum and so were keen to put on a show. Ryan Davidson gave them the lead inside of 15 minutes and he doubled the advantage on 36 as Pagham went into the break with a 2-0 lead. It looked a long way back for Hassocks from there and so it proved, Ryan Cox rounding off the scoring with 10 minutes remaining to seal what has looked to be the Robins fate for some time of a bottom three finish. Hassocks: Nathan Stroomberg; Joe Russell, Will Broomfield, Spencer Slaughter, Jordan Badger; Harry Mills, Dan Stokes, Bradley Bant, Jake Lindsey; Michael Death, Jack Wilkins. Subs: George Galbraith-Gibbons, Connor Bradley, Jake Atherton (used).